If you’ve never done it before, distribution day can be stressful – but it doesn’t have to be. With all the hard work put into the yearbook, you don’t want anything to go wrong the first time the student population gets a look. If you take anything away from this post, let it be this: PLAN AHEAD. Preparation is the key to success! We’ve put together a handy list, so you’ll have everything ready on the big day. Where you’ll keep the books. Before delivery, find a safe place where the yearbooks can be locked up. Work with administration to secure them from everyone. Don’t just set them in the yearbook room. They will disappear. How you’re going to distribute the books. Are they going to be dropped off by classroom? Make sure you have enough carts or other means of rolling them through the halls. Make a list! This could make or break distribution day. Include the name of every student who has purchased a yearbook. 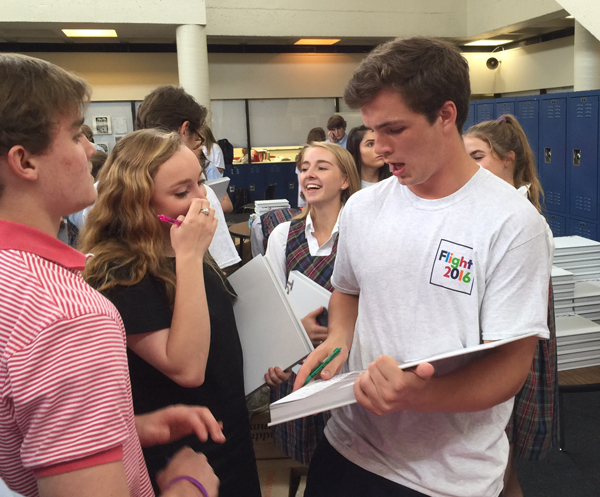 Include a space where students can sign for their yearbook on distribution day. Make sure you’ve got everyone on it – if you sold books online and in the school, make sure you’ve included both groups of students. If you have been entering your in-school sales into Walsworth’s Sales Central, you already have a distribution list ready to go with both in-school and online purchasers! Open a box, and review the final product alone. Check for errors and parts you can praise. Think of ways to deflect criticism. Once you’ve gone through the yearbook, let your seniors and editors take a look. If you sold options, such as clear book protectors or iTags, you’ll get them in envelopes about two weeks before distribution. They’ll be individually labeled by student, so match them up with any namestamped books. Inform students and teachers when distribution day will be held. Get the word out as early as possible, so teachers can plan ahead. Are your lists ready? Does everyone who needs it have a copy? Do your volunteers know what they’re going to be doing? Is everything set up? Do you have a plan for tear-down? Has everything been communicated to the administration and janitorial staff? Have you made the procedure clear to students? You’ll want all hands on deck for distribution day. If you’re having students come to you, you’ll need tables, chairs and big signs to direct them. If you plan to sell yearbooks on distribution day, you’ll need a cash box and change. If you’re handing out yearbooks room-by-room, secure carts. No matter which method you use, you’ll need a plan to deal with trash. Teachers will probably want the sturdy yearbook boxes, but have a disposal method handy for all the papers and wrappings. Set up a pickup place for students who missed distribution day. You may need to mail a few yearbooks for students who have moved. If you have extras, what will you do with them? If you sell them, charge a premium to procrastinators. You can learn more about distribution day by watching this webinar, hosted by Fort Worth Country Day School yearbook adviser Lisa Wallace and Walsworth’s own Mike Taylor, CJE.